Intro by Dezza, 31 May 2018. Article written by Bruce Curran. We all have someone in our life who inspires us to do things that we never thought possible. We all have a person that we look up to as a mentor who provides us with wisdom and encouragement. For those of you that have been following my blog, you will know that I am an avid travel enthusiast. This has led me to explore almost 50 of the 81 provinces in the Philippines. Filipinos say that if you really want to discover the Philippines you need to go to all 81 provinces. This is seen as the benchmark for somebody who has truly explored the Philippines. Obviously, as a foreigner, there are some provinces that you should not visit due to safety concerns. So I might never get around to visiting all 81 provinces but I will try to visit as many as I can – safely. One such man that has been to 58 provinces, and counting, is a man by the name of Bruce Curran. 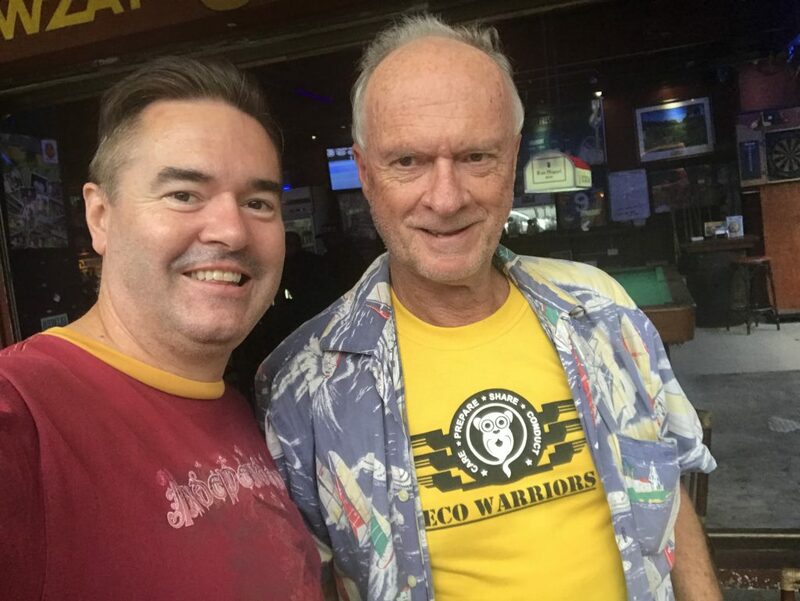 Over the years Bruce has become my travel mentor and has inspired me to get out of my comfort zone and explore places off the beaten track, where the real hidden beauty of the Philippines is found. Bruce is a fascinating character with an absolutely amazing background. Scottish by birth, Bruce’s father served in the Royal British Army Medical Corps for 35 years. As a result of this, the family moved around every three years or so. Just as the family was settling down, they would move again. As a result of this, it is easy to see where Bruce developed his love of adventure. This eventually culminated in an amazing adventure starting back in 1971 when Bruce rode his Norton Commando 750 (affectionately known as Demeter – which means “Goddess of life” in Greek) across seventeen countries and a few continents. This incredible journey started in England and took him to Pakistan via Europe and the Middle East, and then saw him finish off in Africa. Bruce and I during one of our regular catch ups. Always inspiring. Turning our focus to the Philippines, Bruce first visited here in 1988 and then moved here in 1997 when he sailed his 43-foot yacht here from Hong Kong. 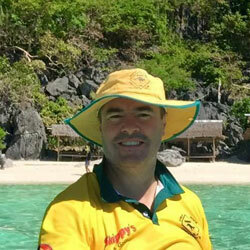 In 2006, Bruce started a banca safari business (a banca is a native Filipino boat). 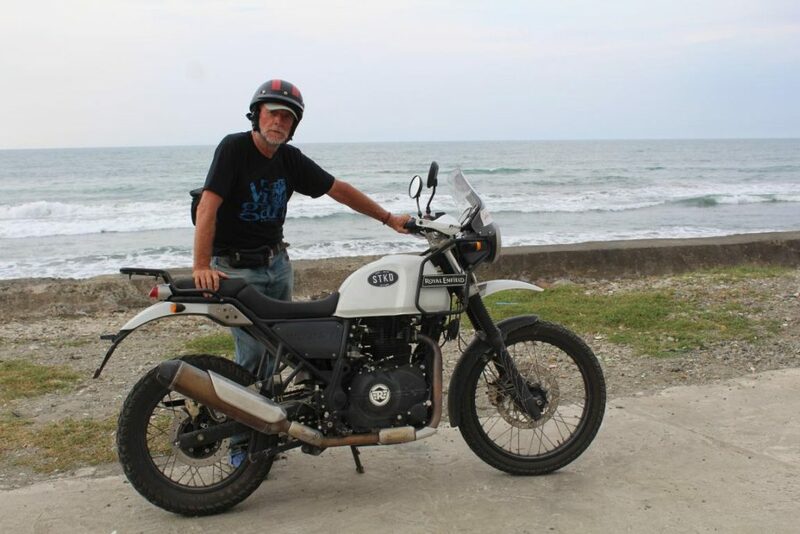 This allowed Bruce to explore the Philippines in the best way you can – by sea. With 7,641 islands on show, there is simply no better way to fully explore the Philippines than by sea. The adventures that Bruce experienced while running his bunca safaris inspired him to write a bestselling book entitled “Combing the Coral Carpet”. At the time of writing this blog, this book has recently been re-released and updated. Combing the Coral Carpet is regarded as a sailing and cruising guide to the Philippines archipelago, as well as bringing environmental awareness with regard to the damage that has been caused to the Philippines reefs by dynamite fishing and other environmentally ignorant and unsafe practices. All in all, Bruce has sailed more than 35,000 miles around the world, 8,000 miles of which was right here in the Philippines. Bruce has also authored close to 20 books and has a goal to complete 25 by the time he is 75 years old. The man is an absolute legend and has inspired me not only when it comes to traveling, but also life in general. He was also an inspiration for me starting this very blog that you are reading now. With Bruce being such a fantastic author, and also an avid traveler, he has written numerous books and blogs about his adventures and some of the best places in the Philippines. I think it is appropriate that I share some of these amazing adventures with you over the coming weeks. The first one I will start with is from Bruce’s most recent adventure in the Philippines. 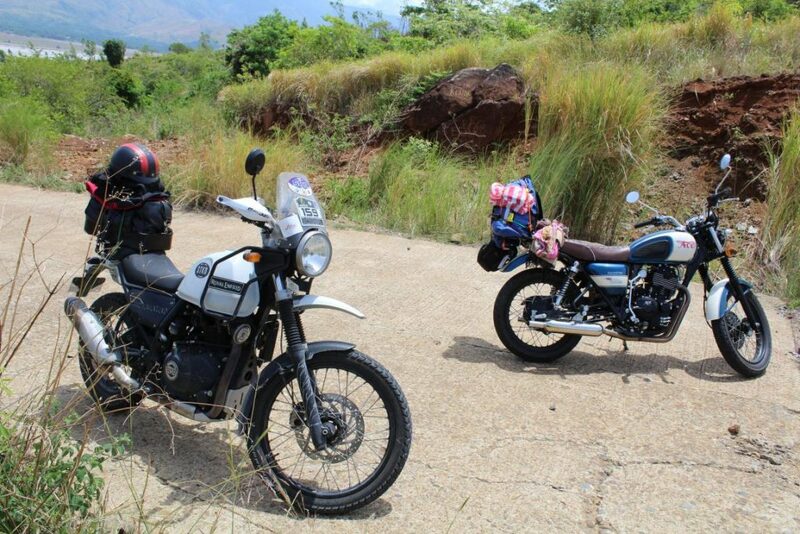 Bruce and a friend, and his partner rode their motorbikes 2,200 kilometres across Northern Luzon, taking in 16 provinces over 8 days. Most Filipinos that I know haven’t been to 16 provinces in their entire lifetime, let alone in one short trip. So please read on and enjoy Bruce’s amazing adventure in Northern Luzon and check out some great Philippines destinations that you can also visit. Out on the open road, the rider and machine become as one as they travel IN the environment, not imprisoned and isolated from the world within a metallic box that comes in the form of a car or van or bus. It is an exciting freedom to be in touch with the surroundings, feeling the wind on your face, the subtle movements of the terrain oozing through sensitive sinews as one weaves a web of intrigue in the fresh air of a new place. Riding has its very own balance that makes the motorcycling experience one of pure intensity, somehow tingling through space totally in control of one’s existence, one’s special configuration and mindful of expectations, on a manmade machine that not only makes life worth living, but makes one totally alive, and immersed in reality that depends on every next motion. Finally, the colourful chaos of Manila traffic has been left behind, and the Expressway to Subic Bay is a relaxing fast ride. The next morning Steve and Jhen on the Ace 400cc motorcycle, and me on the Royal Enfield 410cc, rendezvous south of Olongapo and head north for the first day’s riding along the Zambales coast. Inland the scenic beauty is of the mountain range that meanders all the way to the Lingayan shoreline in Pangasinan Province. Our first stop is at the charming and friendly MOPE resort in La Paz on the open ocean at San Narciso. After a relaxing break, a mango shake or three, a chat with Wilma Gillan a partner at this great beach resort, we head further north along the road to Iba, the capital city of Zambales Province, with an occasional view of the deep blue sea. All in all a very pleasant ride. Sideroad in Zambales. Let the journey begin! Palmera Resort, just north of the main city, has the largest and the most superb thatched and artful circular roof, housing its great restaurant, that I have ever seen. Just north of here we drop by Lindamar Resort, and meet up with the owner Christian, an avid motorcyclist, who is there chatting with Peter Maxwell, an Enfield enthusiast, who are most welcoming and delighted by our ongoing 8-day trip. 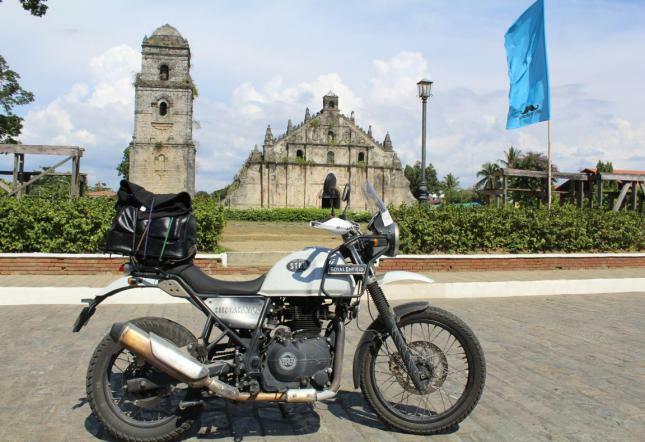 Peter tells us about the Filipina, based in Aparri on the very north coast of Luzon, who is the only Filipina to have ridden a Royal Enfield Himalayan for 19 days in the Himalayas north of India together with 6 Filipinos in 2017. He gives us the address of her family’s place the Hotel Dian so we can rest there and hopefully meet her on our visit several days down the line. 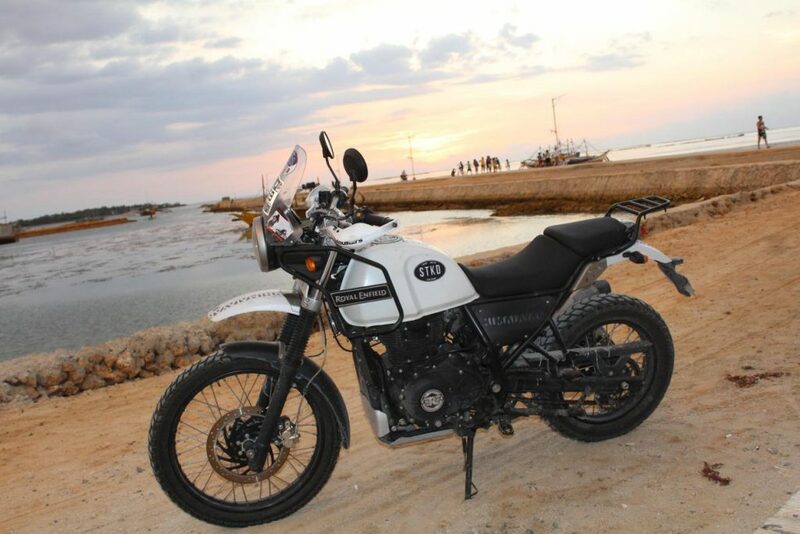 My Royal Enfield 410 cc Himalayan shoreside in Bolinao before our well-earned rest. The rest of the day is a very pleasant country ride through northern Zambales and then into Pangasinan Province and heading north west to the town of Bolinao. 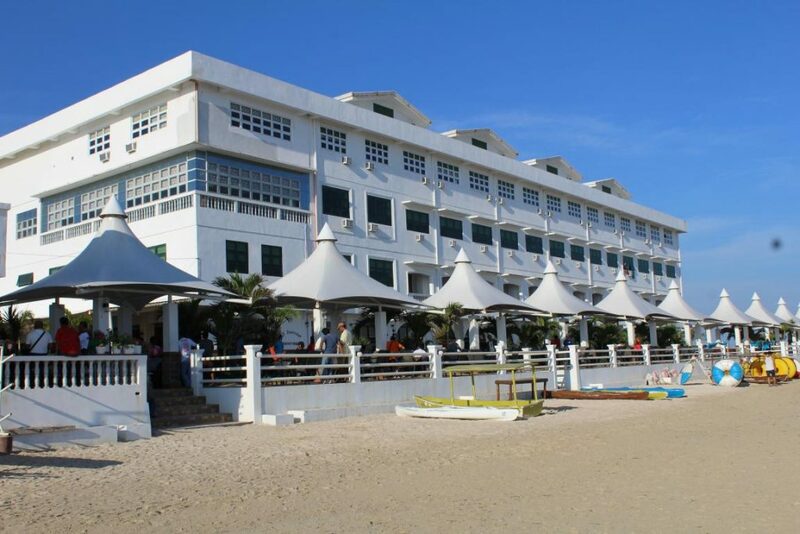 We settle into the brilliant beachfront hotel El Pescador (The Fisherman), that caters for day visitors, upmarket travelers, and also has kubo roomed houses for rent, so smartly caters for all levels of visitors. Adorned with a magic water park with swimming areas, shoots, fountains and clearly is very popular for families with kids who chill out and enjoy the rides and the pools. On their waterfront are bench seats, various watercraft for hire and an extensive handicraft shop next to their open-air restaurant. All in all a very attractive, well laid out, and inviting spot. El Pescador is indeed a place with a unique and welcoming charm on the waterfront in Bolinao town itself. 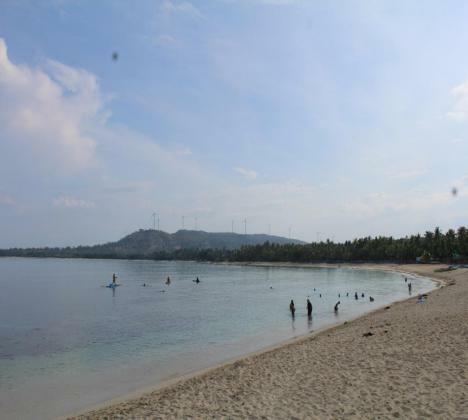 El Pescador is located right on the Bolinao seafront. This a great hotel that caters to all sorts of travellers. Bolinao has a classic old church and a story plaque in the courtyard tells of the Italian priest Faher Odorico, who conducted the first Christian Mass in the Philippines nearly 200 years before the Spanish arrived, in 1324, after surviving a major storm at sea on his way from India on route to China. He thanked God for their survival after seeking shelter in Bolinao. The next day is our ride up into the Cordillera Mountains on our way to Baguio. Before we reach the scenic mountain road, we have to contend with the wicked traffic and road jungles around Dagupan city. Avoid the area at all costs if you fancy a relaxing day’s drive! However, it did make the mountain road drive seem like heaven by comparison, and the distant views were indeed immaculate before we reached more of the now expected and typical city bumper-to-bumper traffic, also a feature in Baguio. My daughter, Shauna Curran, who was Miss Baguio in 2011, and clearly hasn’t lost an ounce of her beauty, and is still a very bright spark mentally, visited us at the V-Hotel. This place is a recommended hotel in a side street, and only a 10-minute walk from Burnham Park and Session Road at the centre of the city. It has now been declared as a world-class “Arts and Crafts” centre city and has many artful places to visit around town. ‘Oh My Gulay’ is an art-full restaurant found near the top of Session Road, and down Session off to the right is a magnificent art and craft centre still being built on several levels – handicrafts, cafes and snack bars and art galore throughout its amazing space. The next day we wove our way down the northwestern road towards San Fernando in La Union Province. A brief stop across from the Surfing capital of the area at San Juan saw us in the cozy and neatly designed Coffee-Cafe off on the right on the main road. The afternoon ride took us all the way to the best preserved Spanish city in the whole country – Vigan. Vigan is a magical place that is full of history and many hidden treasures. A true treasure and a pleasure to roam around. In fact a place that stands out at many levels, and brim full of people soaking in the deep magic of the cobbled stoned streets, the beautiful old Spanish architecture, the many handicraft shops, stone buildings housing bars and restos, and the cobbled streets decked with chairs and tables in the evening to serve customers. 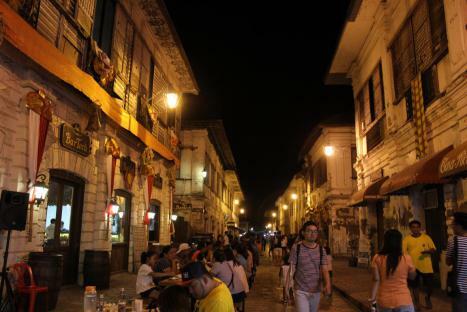 A long walk ambling around the streets is highly recommended and Vigan should be on everyone’s ‘wish-list’ to visit. It was only a night and morning visit for us, but, to be real, should be a ‘several days stay’ to really appreciate the pure ambience of the place. 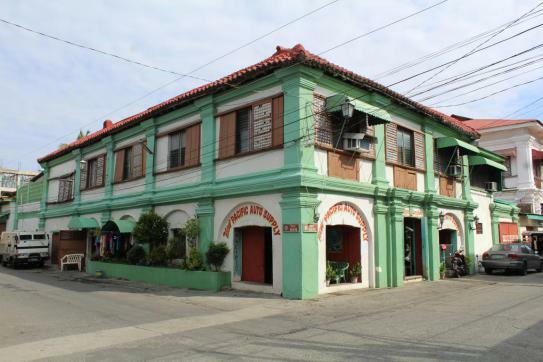 The key feature of Vigan is the old Spanish architecture that really makes you feel like you have stepped back in time. The classic old artful church and tower at Paoay, near Laoag, was our next destination and has its own very spiritual and spirited feel in and around this extraordinarily unique architecture. It was indeed a true blessing to spent time within the main building and in the grounds around the sanctuary of the place. The classic old artful church and tower at Paoay is centuries old. 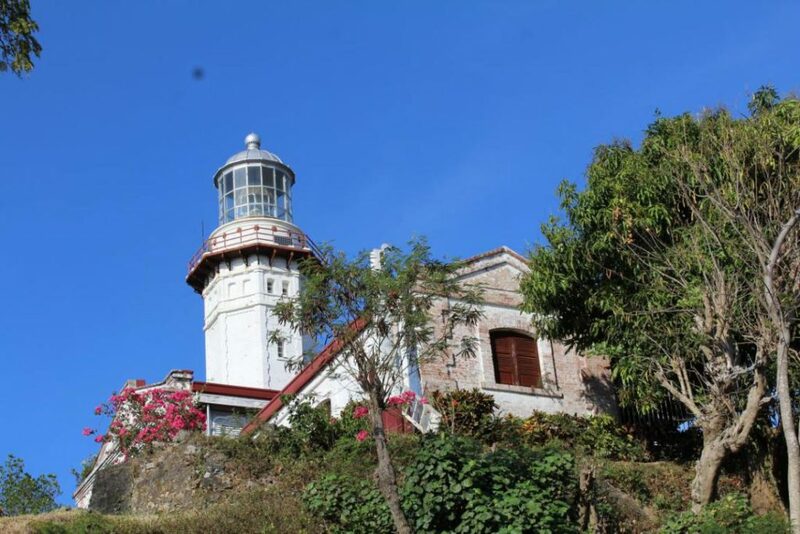 Then it was time to head off to visit the old Spanish Lighthouse, way further up on the Northwestern tip of Luzon, at Bojeador, built in the early 1890s, which still to this day lights the way for seafarers passing along this coastline. Indeed I have used it several times myself from seawards when passing by aboard sailing boats visiting from Hong Kong. The Spanish Lighthouse in Bojeador was built in the early 1890s and is a stunning piece of architecture. Along this coastal road lies the most iconic viewing arena in Ilocos Norte Province, with well over 100 white wind turbines, each at some 70 metres in height, running in line near the shoreline. On this NW tip of Luzon island lies the Bangui Wind Farm, the very first power generating Wind Farm established in SE Asia commissioned in 2005, it was also the biggest, until 2014 when the Burgos Wind farm just to its north took over this claim. 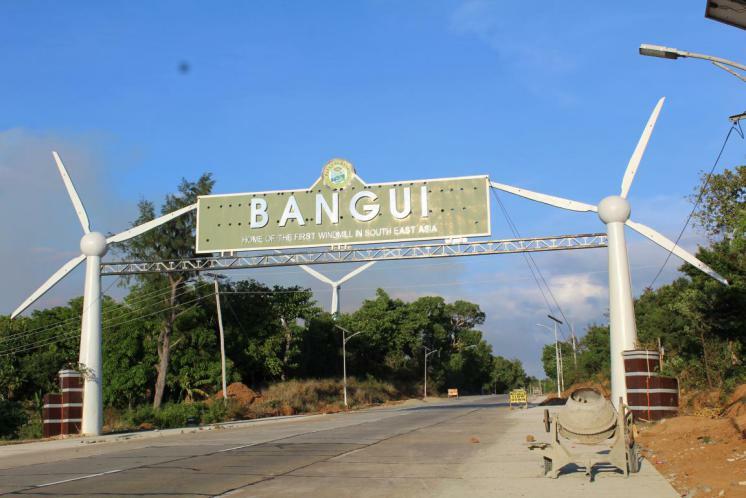 Bangui originally had 19 turbines but now has some 49 Wind turbines while Burgos has around 50, all of them provided by the Danish company Vestas Wind Systems. A third Wind Farm lies in Pagudpud further along the coastline. The beach at Saud in Pagudpud has a number of resorts, some fancy some down to earth. It is a pleasant and popular beach in the open ocean in its own bay. This was the place chosen for our next overnight stay. I have since been told that the Blue Lagoon near Saud is a great beach area to visit in Pagudpud too. Saud Beach in Pagudpud is nicknamed “Boracay of the North”. With powdery white sand lining the shore, it’s easy to see why. Tuesday the 8th May saw us head East, winding around a few coastal hills and along the well-constructed ocean edge Patapat Viaduct, all with great views of the open ocean to the north and the flat rice fields below the mountain area stretching to the south. We turned inland for a ride into Apayao Province for a brief visit before heading SE in order to cross the massive Cagayan River, which is the longest river in the Philippines, and the largest in terms of the amount of water discharge volumes. Then it was a turn to the north to reach the coastal city of Aparri, that lies at the mouth of the Cagayan River. The very North Coast of Luzon Island at Aparri. Here we found the Hotel Dian, that Peter Maxwell had told us about, and was honoured to meet the daughter of the owner Dian Dayag, the Filipina motorcyclist who had cycled for 19 days in the Himalayas in 2017. Alongside several other classy and classic bikes lay her very own Royal Enfield 410cc Himalayan, all taking pride of place in the hotel ground floor restaurant whose decor was all motorcycling gear, artwork and biking bits and pieces, to give a unique and classy ambience. As travelling bikers, we felt very much at home at Hotel Dian. Their latest addition to the hotel was a massive swimming pool and jacuzzi area, tastefully built and neatly laid out with hang out areas close by and snack cafes. The swimming pool and jacuzzi at Dian Hotel was a welcome sight! After a hotel breakfast, we headed out towards the Cagayan Valley’s major city, Tuguegarao, way down to the south of this impressive landscaped area, well known for its massive rice harvests. Traffic build-up brought us back to the realities of urban life, but we hung in there and after passing through this busy city we headed for the attracting magnet of the Cordillera Mountains lying to its West, and rode smoothly on a well surfaced, open and clear road towards Kalinga Province and the hillside town of Tabuk. Once in the Cordillera Mountains, the close and distant scenery was magnificent, but the riding was snake-like and permanently zigzaggy, as we wove and wound our way carefully and gingerly around dozens of hillside slopes. The riding speeds were slow, and low gear was the rule of the way, and top gear was not engaged on the Himalayan bike for the next 2 whole days of mountain biking. Steep climbs and winding river valleys kept us well focused, and it did strike me that I did not see one pedal bike during the entire time in the Cordilleras, which made a lot of sense and told its own story about the type of terrain we were immersed in for the next two whole days. After a considerable amount of arm and riding exercise, several rest stops, magic scenery on all fronts, we arrived late afternoon in Bontoc, Mountain Provine and found the Ridgebrooke Hotel on the main road in the city after taking the turning to cross the river bridge labelled as the way to Banaue. The daughter of the owner, Brooke, was very helpful and a very friendly soul, and we thoroughly enjoyed our overnight stay, and would recommend this hotel to all travellers, with its welcomed off-road parking to boot. 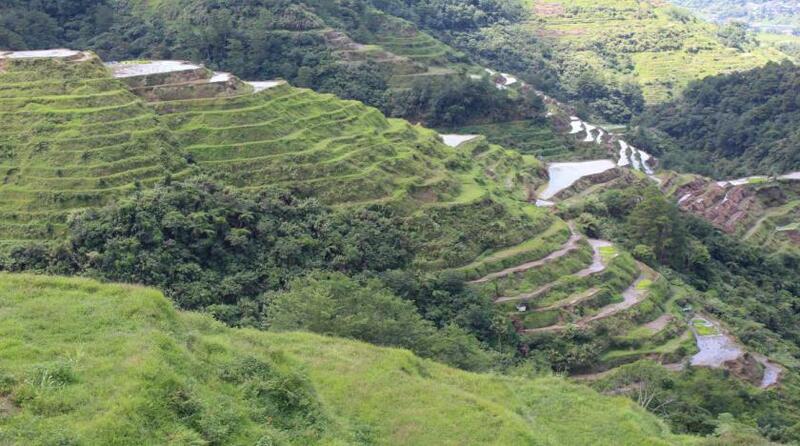 I never get tired of the Batad Rice Terraces in Banaue. They are a truly magical specatacle. Yet another sunny morning, as every day had been, saw us on the road by 8.30. Banaue, in Ifugao Province, was the star destination for that Thursday the 10th May. It was another winding zigzagging route at gentle speeds on the bikes. There were many landslide piles, and rock falls en route, and in some places, machines and workers were repairing or resurfacing the roadways. 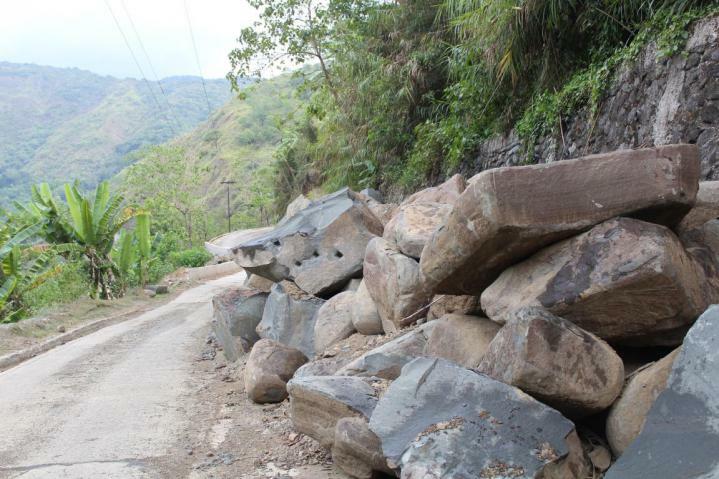 Some of the landslide areas along the way. A great deal of care needs to be taken, especially on a motorbike. Little rocks from falls littered the surface in many spots, and it was a matter of being very observant and riding with great care to avoid any bike falls. As a result, it was an intense ride before spotting the first artful human-built rice terraces that the area is so well known for. They cover a large area all around the hillsides of Banaue, and it was a pleasure to see the human ingenuity that has gone into this entire mountain area for many centuries, started by the ancestors of the indigenous people, namely the Ifugao tribe. Banaue town had areas laid out full of handicraft shops, brimming with wood carvings, textile weavings, and many locally made arty products. Many of the handicrafts, as well as being amazing visually, have practical purposes, like furniture, while many others are works of art. All three of us bought several items, as gifts, as mementoes and for personal use, like a bag or two for use along life’s journey. After a very pleasant ramble around the shops with their warm and friendly staff, it was time to head out, and bike down the mountains back into the lowlands of Central Luzon. The final rest stop before hitting the flatlands was after passing through Lagawe town, where the very pleasant Gazebo Resto and Cafe gave us a relaxing ambience and a neat view of some rice fields. This was to be the longest bike ride of our 8-day outing and would put us to the test at several levels. After escaping from the long and winding Cordilleras we hit ground-zero on the main highway that runs north/south through the provinces of Nueva Vizcaya and Nueva Ecija. I use the term ground-zero in the sense that here was the main road for traffic, particularly heavily laden large trucks and lorries, making their daily deliveries to the north and south. The laden vehicles were climbing the hill passes at walking speeds, and queues were banked up behind them on the roadway with its umpteen turns and curves, sporting only a few straight lines for passing abilities. Thank goodness we were on bikes, which made overtaking far easier than for the cars and vans and other light road vehicles. The frustrations were continuous, and even on the long straighter flatland roadway, the continuous flow of oncoming traffic made passing the big guys tantalisingly nerve-wracking. The journey went on and on, and close to dusk, we were hoping for total relief as we were heading for the Expressway near Tarlac. Our heads were full of visions of the one-way open road and top road speeds to finish our journey for the day’s last long run into Subic Bay. Finally, the turn to the expressway appeared before us, and we headed down, through the toll gate and into top gear. Almost immediately that we hit the long open road it started pouring with rain. It had been spitting a little rain earlier, but here at dusk it felt as though we had been targeted directly by the heavens above, and after getting totally soaked from head to foot, we took shelter at a gasoline (petrol) station, had a hot coffee and twiddled our thumbs for an hour on the roadside hoping the heavens would change pace and offer us a clear bright passage. This eventually happened, and in the darkness of the night, we sped full throttle the final 130 kilometres to our destinations and homes south of Olongapo City, back in Zambales Province. We had left Bontoc at 8.30 am, and we arrived in Subic Bay soon after 10 pm. It had been a day with a mission, and it had definitively drained our reserves, but we accomplished our mission, and I for one fell asleep before my head hit the pillow! Late the next morning I decided to amble my way back to Makati in Manila going via Morong in Bataan, passing Mount Samat before joining the traffic to San Fernando, and getting back on the expressway heading for Balintawak. Edsa was a nightmare, as usual, the heat wave was full-on, and in Balintawak, Cubao and in Ortigas the traffic was at a standstill, and I boiled on the bike. Finally, there was relief, and after weaving and jumping between and through the lines of metal I headed for the Handlebar, which was having its 15th Year Anniversary in Polaris Street, Makati. I downed 8 beers, one to celebrate each day on the bike on the road, and raised my bottles to Bolinao, Baguio, Vigan, Pagudpud, Aparri, Bontoc and Banaue and Subic Bay before gently riding the bike back to its home place on Bagtikan Street in Makati, at the Royal Enfield showroom where it will take its well-deserved rest. We had fully immersed ourselves in the gist of the motorcycling experience, running every which way, along open coastlines, weaving around mountain pathways, through river valleys. The whole jigsaw and tapestry of life had carried us through to a successful conclusion. Every journey by bike is definitely eternal, and you will soak you occasionally in a stream of downpours that will strike like lightning and spark up a million thoughts. There is Always Time to Ring that ‘Bell of Life’ … Go Well, Stay Well, and Continue to Enjoy Life’s Journey. Please visit Bruce’s website and give him some support. Please don’t forget to leave your comments below and feel free to share! Also, don’t forget to check out my related articles below.